Docent is a title at some European universities to denote a specific academic appointment within a set structure of academic ranks. Docent is also at some universities generically used for a person who has the right to teach. From the above references the Surfing Heritage Foundation likes to think that their docents who volunteer time at the Heritage have stretched the old meaning a bit. This is because these docents are not merely lecturers or guided tour specialists – no these people have a little bit of salt water running in their veins. The Surfing Heritage Docents have many points of reference connecting them to surfing but the strongest link is that they are all practicing waterman and women. Surfing, its history, and practice surround them. Frankly, many of the docents are more at home in the water than on land. They all have a deep understanding of the history of surf and therefore can teach it well. Some in fact are woven into the fabric of surf history itself with their own special stories. Take for example Ron Sizemore; Sizemore grew up in Laguna Beach where he still lives today. One of Ron’s father’s surfboards that he shaped many years ago is now a part of the permanent collection at the Surfing Heritage. Sizemore himself was featured in the Vietnam War documentary film on surfing called, Between the Lines, as well as the more recent film on Newport Beach called, Living It Forever. Ron served in the 9th Infantry Division in the Mekon Delta during the Vietnam War. He ended up getting stationed at Vung Tau (called Cape St. Jacques by the French) on the China Sea. Sizemore says it was a port and an “R & R center” with one of the best beach breaks in the country. He worked at night and often helped lifeguard and surf during the day. In 1961, Sizemore won the U.S. West Coast Surfing Championship by shooting the pilings of the Huntington Beach Pier… backwards - a feat aired nationwide on ABC’s Wide World of Sports. Another docent is Chris Simpson. Chris‘s linage to surfing goes back to his Wind-an-Sea “Rat” days, growing up on the La Jolla reefs and his lifeguard years for San Diego City Lifeguard Service where he mastered all aspects of being a waterman. While lifeguarding, Chris took a keen interest in woodworking. Over the years he has applied his skills to a variety of projects including many of the pieces at the Surfing Heritage. One of Chris’s hobbies is making classic wood replicas using exact measurements of boards rode long ago. Chris has a replica of a Simmons Spoon that is not only incredibly beautiful to look at, he surfs it all the time. Actually, to say that he surfs it is an understatement, he simply shreds on it! If you have a question on wood surfboards and how they were made, he’s a go-to-guy. Ron and Chris are just a few of many Surfing Heritage docents that lend a bit of their own background and history to the Foundation. It’s this special collection of dedicated people that give their time and effort to help preserve Surfing’s history that makes the Surfing Heritage docents special indeed. 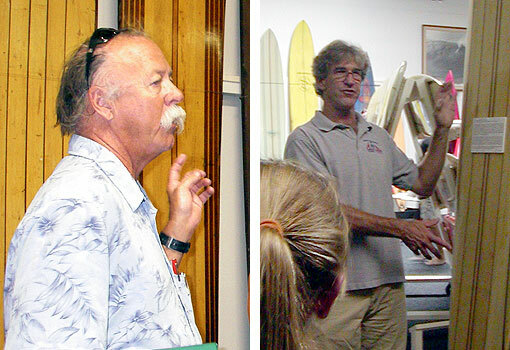 Ask for a docent led tour the next time you visit the Surfing Heritage Foundation – you may be surprised what you’ll learn. (Please call in advance to make an appointment for a docent led tour).